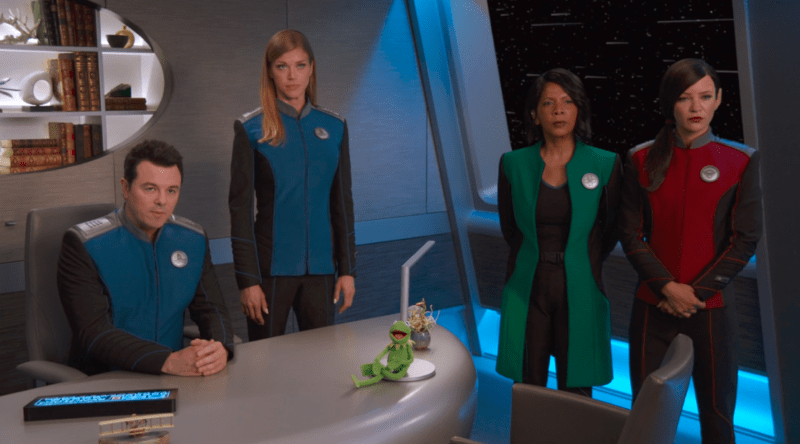 This week’s Orville was all about girl power, and it was a long time coming. One of the things that this show does so well is take a well known sci fi show trope and spin it on it’s head to provide social commentary on a current issue. Another thing that it does well? Gives us Trekkies little Easter eggs along the way. This week’s episode was wonderfully directed by Number One himself, Jonathan Frakes. Without any further delay, let’s dive right in to “Sanctuary”. 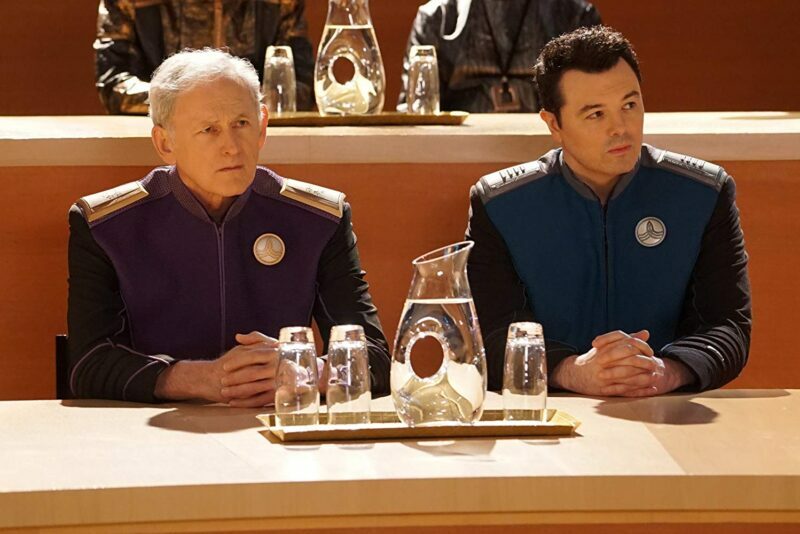 The Orville is asked to deliver a Moclan scientist (and his mate) to the Neccar system where they will rendezvous with another ship. Upon arrival, Talla shows Korick and Toren to their quarters, where they quickly check the room (which isn’t at all suspicious, guys).They are clearly smuggling something, as they reveal when they open their rather large luggage, but we’re left guessing the contents as the beginning credits roll. In class, Bortis’ son Topa refuses to share his toys with his female classmate, claiming that his father says he does not need to respect women and ending with him shoving her. The teacher runs over to gather the girl child into her arms, and the true Trekkie in me actually shouted with joy as I saw that she was played by none other than Deanna Troy herself, Marina Sirtis. She pulls Bortis and his husband into her office to discuss Topa’s behavior, and while Bortis is obviously embarrassed and apologetic, Klyden frankly is not. Indeed, when they get back to their quarters, the parents openly disagree about the level of punishment their son should receive. Before they can finish their argument, Bortis receives a message from Commander Grayson that Korick and Toren are using too much power in their quarters, and he needs to investigate. They invite him in when he shows up, but with extreme amounts of caution. Bortis demands to see what’s in the luggage and low and behold, it’s a Moclan child – a girl. If you didn’t catch the season 1 episode “About a Girl”, the Moclan race is composed entirely of males. That is not to say that females aren’t occasionally born, but they are “reassigned” gender at birth. Bortis and Klyden’s child Topa was such a baby, born a girl. Ultimately, through a tough legal battle, Bortis relents to his husband’s wishes (and Moclan law) and allows them to change Topa to be a boy. Korick and Toren are familiar with this trial, and to some extent, trust that Bortis will be sympathetic to their efforts. They are not on a scientific mission, they’re actually fleeing Moclan and seeking refuge with their daughter on another planet. They have obviously put Bortis in one hell of a sticky position, but he agrees to keep their secret for the duration of their journey. He does however, show the secret to one individual – Topa, whom he brings around to try to erase some of the prejudice that Klyden has instilled. He explains to his son that sometimes Moclan’s are born female, and while some people fear them, she’s not so different than he is. The two Moclan leave with their secret in tact, but shortly after Bortis is called into Ed’s office. Turns out Topa did talk, but only to Klyden, who of course felt the need to tattle. (Side note, I’m about done with Klyden. Bortis deserves better!) Ed and Kelly are of course sympathetic to his reasons, but their primary concern is that none of them verified that Korick and Toren were the babies actual parents, and she might have been kidnapped. They need to track them down to verify their story, and fast. But strangely, the vessel they boarded has disappeared, nearly without a trace. Gordon remembers a clever trick from his party days, and they’re able to track down the masked ion signature. The vessel though is not headed to Ritepsia as they said, but instead into a hidden star system and inside of it? Three planets, one inhabitable with thousands of life signs, all Moclan. Ed, Kelly, Bortis and Talla take a shuttle to the planet’s surface and discover the Moclans are all women. Naturally they’re met with hostility until they are taken to the leader – Heveena. She had attempted to help during Bortis’ trial, and here again, is leading the quiet revolution. It seems she’s cobbled together a small network of ships (the allusions to the Underground Railroad are loud and clear here) which serves to get female Moclans and their families to this planet. In all, there are 6,000 Moclans in hiding. While initially she wants to evacuate the planet, Ed convinces her to let him petition to turn their colony into a sovereign state, therefore free of Moclan rule and under the protection of the union of planets. She agrees, with one caveat – that she be allowed to go and speak. Ed and Heveena’s trip to Earth is a pleasant one, where they talk about the freedom women from Earth have had for centuries to create art, careers, and control their own destinies. Ed allows her to search through the shuttles archives and she is quick to find what she declares to be the female Moclan revolutionary battle song (“9 to 5” by Dolly Parton.) Ed makes an attempt to tell her that’s not exactly the intention of the song, but Heveena won’t be convinced and after all – it is one hell of a battle cry! 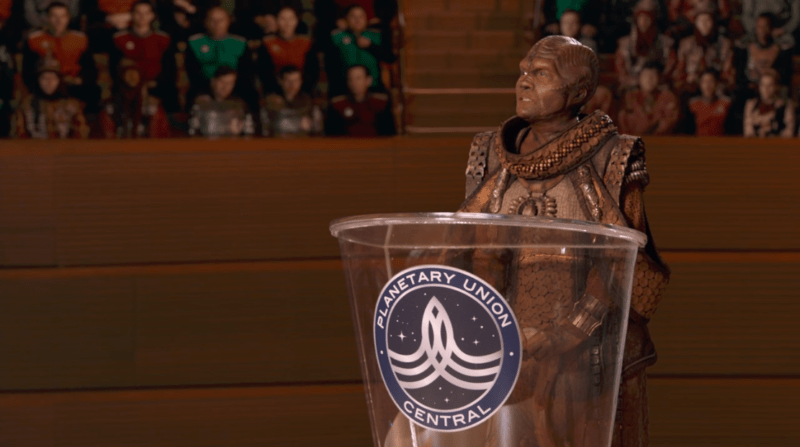 Back on the Orville, Kelly and crew are standing guard when a Moclan battleship arrives, claiming they are only there to wait (as they are) for the verdict, presumably so they can quickly invade the planet and take the women back to Moclus for gender reassignment surgery. They go to yellow alert, and stand by for news. The representatives from Moclus however, are unmoved by Heveena’s speech and declare that if this colony is granted sovereignty, they will renounce their membership to the union. An empty threat before, perhaps, but now that there is the threat of the Kaylon attacking coupled with the fact that Moclus supplies all of the unions weaponry, there are other matters to consider. Ed tries to convince his admiral superiors (a truly impressive cast group, by the way, which includes veteran actors Victor Garber, Ted Danson, Ron Canada and Kelly Hu) that while he’s the first to defend the prime directive (to use a Trekkie term), this is about the rights of the individual. And if they place weaponry over those rights, then what exactly does the union stand for? Back on Earth they struggle to come to a decision regarding the sovereignty, but Ed offers a great point. If they do leave the union, their only ally would be the Krill, and they couldn’t take on the Kaylon threat themselves. But the tiny female refugee planet would likely stay under the radar so in the end, even if all of the male dominated Moclus was destroyed, at least they would retain their single gendered tradition, only with females. This point convinces them to a compromise – the refuge isn’t granted sovereignty, and agrees to stop their underground network. In exchange, Moclus is to leave it alone entirely. It’s a tentative agreement, but it stops the fighting. The Orville airs Thursdays at 9 on Fox. What to Watch – ‘Rent: Live!’ Jan. 27! “Miss Adventure Falls” to Open at Disney’s Typhoon Lagoon on March 12!